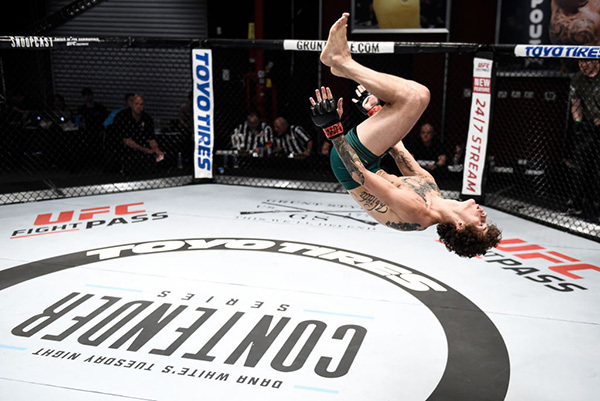 Sean O'Malley</a> does a backflip as he celebrates his knockout victory over <a href='../fighter/Alfred-Khashakyan'>Alfred Khashakyan</a> in their bantamweight bout during Dana White's Tuesday Night Contender Series at the TUF Gym on July 18, 2017 in Las Vegas, Nevada. (Photo by Brandon Magnus/DWTNCS)" align="center" />Sean O’Malley had everything you want to see in a fighter when he stole the show on Week Two of Dana White’s Tuesday Night Contender Series in July. From charisma and flash to a highlight reel finish, the Montana native hit all his marks with style as he knocked out Alfred Khashakyan. On Friday, O’Malley is back in Las Vegas to make his UFC debut against Terrion Ware. But will he still be “Sugar” Sean as the crowd and platform gets even bigger? It’s the answer you expect from the 23-year-old, who took over the MMA world for a minute after his win over Khashakyan, and while the Summer of Sugar may have given way to a more sedate fall season, there is no dip in the confidence level of O’Malley heading into the latest “biggest fight” of his career. In fact, it’s business as usual for a fighter who hasn’t seen life change too much for him since earning his first UFC contract. “My girl and I bought a house, so that’s a big change, but other than that, I’m still training, and life’s pretty much been the same,” he said. And while Ware and the rest of the up and comers on the bantamweight roster will love to get a crack at the kid who got so much attention over the last few months, O’Malley doesn’t feel like there will be too many potential opponents lining up after they see this week’s bout. That kind of vision has nothing to do with the speed and reflexes of youth. That’s a gift you either have or you don’t. O’Malley started realizing he had it when he began training with his MMA Lab teammates in Arizona. Now 8-0 as a pro, O’Malley is still young in life and his career, but he’s had no reason to think that things won’t keep going the way they have when he faces Ware. Eight wins, six finishes, five knockouts. Yeah, things are right on schedule for the man in charge of “The Sugar Show.” Just like he planned it.